RCA (DRC69705E28G) - 7-Inch Dual Screen Mobile DVD Player and Game Pad System - Set of Two 7-Inch Screens, (6-Piece Kit) Make road trips more enjoyable with RCA's Mobile DVD System. Using your vehicle's headrest, the 7" screens mount securely using provided straps. Each screen has a built-in speaker for listening enjoyment- no additional assembly, cables, or mess required. Switch up the fun with the included game controller and digital videogames. 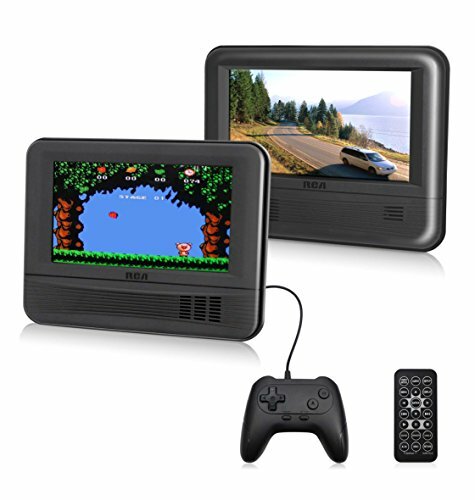 Variety of digital games conveniently pre-loaded and easily controlled with included gaming pad controller. AV cable is provided to connect both monitors, or allow one user to watch a movie while the other enjoys playing an assortment of 20 built-in games. Both protected with anti-skip technology. Quiet backseats and unlimited entertainment calls for both happy kids and parents. SCREEN SET: 7" DVD player + 7" LCD Monitor. Option to watch a movie on one screen while gaming on the other. ACCESSORIES INCLUDED: Remote control (w/batteries), Car power adapter, and 2 Car headrest mounting straps.